In popular science news this week, we find a story about the largest insect ever photographed. The culprit caught in the photo above is known as a Giant Weta. So, you may ask, what exactly is a Giant Weta? And, how exactly can you find (err, avoid) this critter? 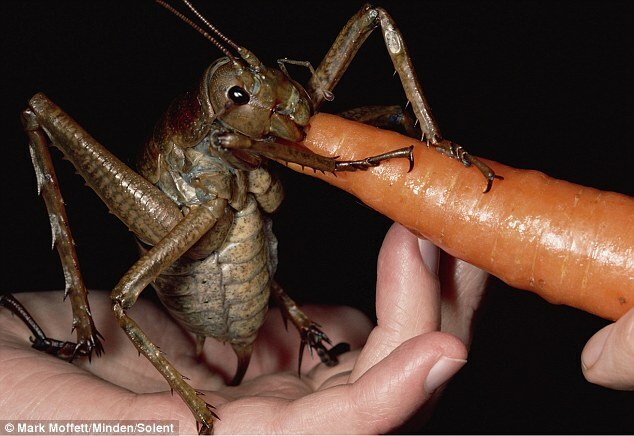 As you can see in the picture above, the Giant Weta (Genus: Deinacrida) looks a lot like a monstrously huge cricket (and in my opinion, a whole lot like those camel crickets I have running around in my basement). This is because they are also member of the insect order Orthoptera, which includes grasshoppers, crickets, locusts, katydids, etc. The order Orthoptera is subdivided into two suborders, Ensifera and Caelifera. Caelifera includes the grasshopper and locust species. The Giant Weta belongs to the other suborder, Ensifera, which includes crickets and katydids. The closest relatives to the Giant Weta are thought to be the Jerusalem Crickets (Genus: Stenopelmatus), which are flightless with specialized structure for burrowing and are native to the Western United States. Giant Wetas are endemic to New Zealand and found primarily on small offshore islands. The largest of these species is the Little Barrier Island Giant Weta (Deinacrida heteracantha), which is found only on one small island, Little Barrier Island on the northern end of New Zealand. Small species endemic to islands tend to be much larger (island gigantism) than their closely related mainland species. In contrast, large endemic species tend to be much smaller (island dwarfism) than their mainland relatives. This pattern is thought to emerge because the restriction of space and resources on islands makes life hard for larger species, exerting strong selection pressure for smaller size and fewer resource requirements. On the other hand, the presence of fewer, smaller predators can reduce the selection pressures on smaller prey, allowing then to evolve larger, more conspicuous forms. This biological phenomena is likely related to the evolution of Giant Wetas in New Zealand. New Zealand has geographically isolated for 80 million years and largely free of any mammalian predators, with the exceptions of bats, until recently. This had led to evolution of many unique species, including flightless birds, such as the Kiwi. However, the human introduction of mammals, especially rats, to the islands has led to the extinction or harsh population reduction of many native New Zealand species, including the Giant Wetas. It is also important to point out the Giant Wetas aren’t the only cool, giant insects out there. For example, Goliath Beetle larvae (Genus: Goliathus) can easily rival the Giant Wetas in weight, although adult beetles are smaller. Additionally, if we used a different measure, length, the Giant Wetas would be dwarfed by stick insects. The longest species of stick insect (Phobaeticus chani) can reach lengths of almost 2 ft. long (~22 inches). Also, it is worth checking out this cool video about a Giant Weta breeding program in Auckland, New Zealand.